Yay! The girls are making a comeback! From previous posts, you may know that the boys were taking over. Almost to the point that I was worried about the population and genders. I was convinced that boys were taking over the population! Don’t get me wrong, I love those baby boys but do love working with those sweet little baby girls too! I mean how can you resist this little one? It’s funny how the tinier they are, the more feisty they are. Feisty according to the dictionary is worded as having or showing a lively aggressiveness. This sums it up for me. She let me know what I was going to be able to do. She was great, just didn’t want her hands messed with. Newborns have a great way of communicating with you during posing, and let me know right away what they are up for. Of course, after a full tummy that pretty much goes away…so milk, of course, = happy newborns. Ahhh, I love this simplistic, organic style. All she needs for an accessory is her gorgeous dark hair. Which is great because she was not a fan of having anything on her head. Lucky girl to have that thick dark hair. We got some hat and headband shots, but worked them in quickly. I had such a hard time picking which photos from this baby girl’s session to feature. I guess that’s a good problem to have right? Just as mom and dad had a hard time picking out too! Guess that means a job well done. She is one of those babies that looks great with any color and any style. And again with that gorgeous hair! It stayed nice and groomed on her own and just grows in the right direction. I had babies that had lots of hair but always sticking straight up no matter what we did to smooth it. Now at ages 9 & 12 it has simmered down a bit. 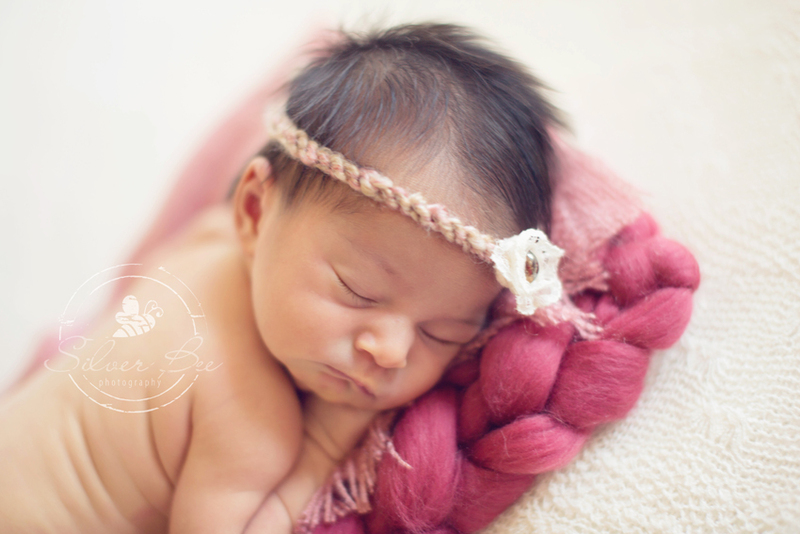 I really enjoyed working with this family and their sweet newborn baby girl. They have such a love for this little one and you can see that in their smiles and excitement for her. She is a keeper in my book! Thanks so much for bringer her to me and hope you treasure these photos for many years to come. Photographers, if you are interested in mentoring or workshops you can check out more info here. It’s a great opportunity for any of you looking for one-on-one mentoring and fine tuning your posing and technique. Thanks so much!